The 2nd GLBC Symposium was held on September 8-10, 2016 at the UPMC Cancer Pavilion in Pittsburgh, PA. The symposium was made possible through collaboration between the UPMC Hillman Cancer Center, the Case Comprehensive Cancer Center (CCCC), and The Ohio State University (OSU) Comprehensive Cancer Center (James Cancer Hospital and Solove Research Institute). The GLBC Symposium is sponsored by the UPMC Hillman Cancer Center and University of Pittsburgh School of Medicine Center for Continuing Education in the Health Sciences. 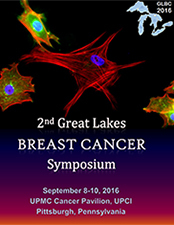 The 2016 GLBC Symposium focused on various topics of importance and relevance to researchers, clinicians, and advocates who are interested in breast cancer research and clinical trials, and aim to increase collaboration between these three cancer centers in the area of breast cancer research and clinical trials. A keynote talk was given by Dr. Joyce Slingerland from the University of Miami Health System. View the 2016 symposium brochure.